Alanna and the Tree was designed specifically for 7-12 year olds. An ecological tale about a young girl’s battle to stop the building of a road through her village, Alanna proved to be a great success with children and adults on its nationwide tour. The show received high praise from the national press, being hailed as “yet another winner” by the Times Educational Supplement and applauded by the Independent on Sunday …”Green Candle deserves to be praised from the rooftops“. 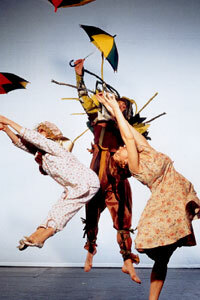 To complement Alanna and the Tree, the Spring 1996 tour saw the revival of the company’s popular 1993 show for 3-7 year olds, Sooki and the Kozzibimweh.